There’s a very old charm in the number 7, and it applies with a capital C to the final production of Haymarket Opera Company’s seventh season – a thoroughly charming romp through Antonio Cesti’s “L’Orontea.” This 17th-century concoction of romance, light-hearted comedy (with one leg in farce) and good tunes is just the ticket for some pre-summer fun. In no time, the Queen is ready to hand over the keys to the realm and make Alidoro her King. But meanwhile, one of her ladies in waiting, Silandra, also falls for the artist, who returns her affections – which sends the Queen into a royal pique. Hmm. What can she offer this fine specimen of manhood that Silandra cannot? How about a crown and septer? Done. Alidoro repudiates Silandra quite ungenerously and begins to preen about as King of what is now his castle. Meanwhile, Alidoro’s elderly mother – yes, she has fled with him – takes a shine to the buff lad Ismero, who’s actually a woman in disguise, and a tiresome old courtier, Corindo, is plying Silandra with gold in exchange for her affections. Wandering, or stumbling, in and out of these amours and misapprehensions is the servant Gelone, his head festooned with grape leaves, his hand ever clasping a bottle of vinous nectar, his belly rounded by the excesses of happy hedonism. I could do worse than to begin this appreciation of Haymarket’s merry enterprise than by citing David Govertsen’s vocally robust and dramatically devout impersonation of the perpetually sotted Gelone. Now on to the Queen. 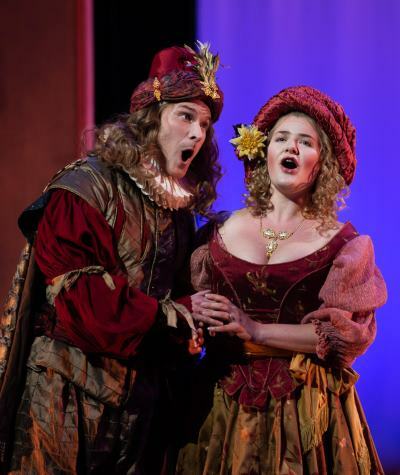 Soprano Emily Fons was lovely in the title role, a monarch not quite sure of herself who finds in the newly arrived artist the prospect of a lover, an anchor and maybe a helping hand. Amid all the craziness of Cesti’s opera, there’s palpable truth in Fons’ performance. She sang magnificently, her voice warm and lustrous, and she summoned a character who was not of commedia dell’arte but of life in its complex reality. Fons’ Orontea lent the wacky play an honest core. 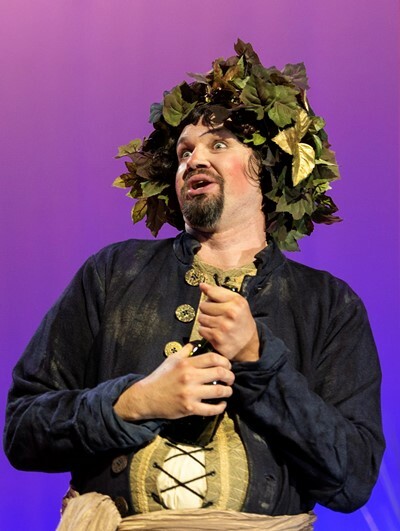 And she was well met in tenor Scott J. Brunscheen’s opportunistic Alidoro. Brunscheen delivered Cesti’s fluid melodies with effortless grace and authentic expression. At the same time, he managed to portray a man who’s at sea even on solid ground. In the funniest sense, Brunscheen’s adaptable painter just goes with the flow. Good singing and spirited ensemble comedy ruled across the supporting cast. 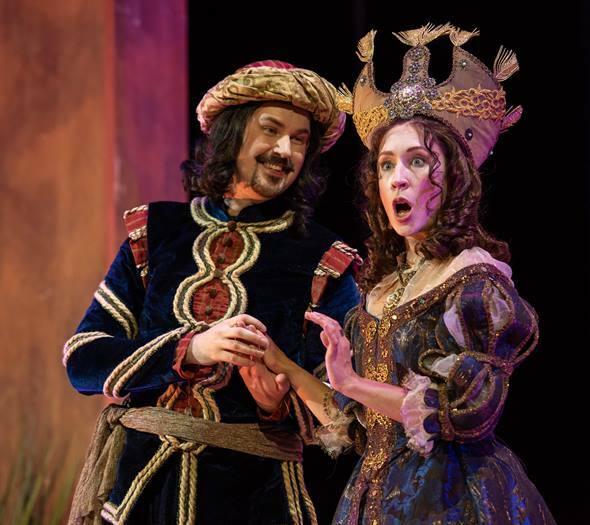 Addie Hamilton, in superb and emotionally pliant voice, did excellent double duty – or is it double-double – as a woman disguised as the brigand Ismero at Orontea’s court and as Philosophy in a prologue debate with Love about which of them is more influential in human affairs. Kimberly Jones’ Love, bounding about the stage to much laughter in a blue flared costume with white wings, threatened to steal the show before it had even begun. Jones was also a vivacious presence as the Queen’s page. 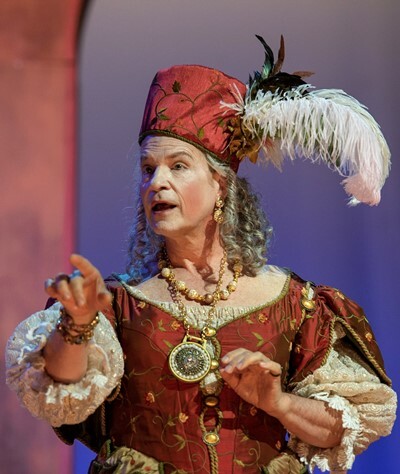 Rounding out this bright cast are Drew Minter as Alidoro’s still-sparky mother, Daniel Bubeck as the salacious old courtier Corindo, Nathalie Colas as apple of his eye Silandra, and Ryan de Ryke as the Queen’s worried counselor. In no small part, Meriem Bahri’s brilliant costumes pull one into the magic of all this nonsense. And while the dramatic mode here is largely enter, stand and sing, exit, that simplicity is forgiven by both the appeal of Cesti’s arias and the singers’ earnest delivery. All of this is heightened by studied, stylized hand and facial gestures clearly meant to recreate 17th-century mannerisms. Designer Sarah JHP Watkins’ set is simple, colorful and practical. Likewise, co-directors Minter and Sarah Edgar have imbued the show with directness, efficiency and fluency. The accompanying band, led by bassist Craig Trompeter, is minimal, too: just five instruments – two violins, bass, theorbo and harpsichord. Program notes suggest this also is in keeping with period practice. If one might imagine a somewhat fuller pit, Haymarket’s polished quintet never left one to wish for more.